If you are throwing a baby shower and still pondering over what food to serve on the day, what about having the theme of afternoon tea? Although it might once have been considered an old-fashioned English tradition, afternoon tea has regained popularity in recent years. Sandwiches, scones and cake might seem like a plain choice, but are sure to satisfy all tastes and can be beautifully presented on tiered stands. 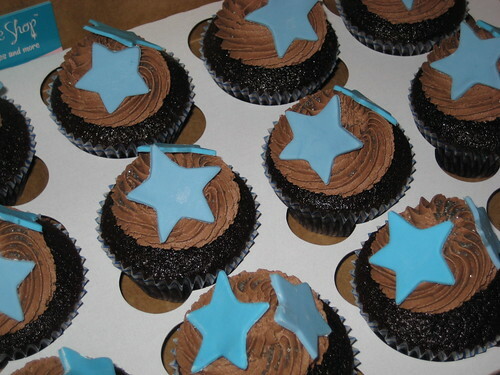 And if you are wondering how something as simple might be personalised, the answer lies in the cupcakes – the possibilities for how these can be decorated is almost endless. It’s your day to plan, but here are some ideas for each of the elements of afternoon tea to get you started. Traditionally cucumber sandwiches might have been served with afternoon tea, but choose whichever fillings you know that you and your guests will enjoy. Whether it’s cold meats, tinned tuna or salmon, cheese and pickle, hardboiled egg and cress, you decide. Why not go for a selection of different sandwiches? And don’t forget to vary the bread – slices of white, whole wheat or multigrain can be cut into dainty slices or be more adventurous and use cookie cutters to produces sandwiches in different shapes. If you prefer, have mini buns or for a modern twist fill pita pockets or wraps. Purists will say that with afternoon tea you should have plain or fruit scones served with jam and cream, but there’s no need to limit yourself to that. Whilst dried vine fruits might be the norm in scones, cranberry and orange, date and walnut or apricot and ginger are all winning alternatives. Savoury scones also work well; cheese are usually top of the list, but add mustard or herbs to these for variety. With so many options for these, it can be quite a decision. You probably can’t go wrong with a vanilla or chocolate cake mix, but really whatever sweet flavour you can think of can be transformed into a cake. Anyone for butterscotch, cherry, cinnamon or mint? A cupcake isn’t really a cupcake without the frosting and while you will usually go with a topping that compliments the flavour of cake you have chosen, it is quite common for at least some of the cakes to be iced in pink or blue depending on whether it’s a boy or girl that you are expecting. And don’t just stop with the frosting; add sweets or sprinkles to add the finishing touch to your cupcake. Afternoon tea wouldn’t be complete without a cup of tea and again there are so many varieties to choose from. It comes down to personal taste, but Earl Grey is a popular choice. Whilst we are encouraged to be sensible with our caffeine intake during pregnancy – the Public Health Agency of Canada advises no more than 300mg of caffeine daily – this still allows us to drink up to three cups of strong tea daily. If you would rather stay on the safe side, there are plenty of decaffeinated teas available. Alternatively, particularly if your baby shower is in summer, why not serve traditional cold drinks such as cloudy lemonade or ginger ale? Jugs of fruit juice or smoothies are also good options. Now that you have your food and drink planned out for your baby shower, all that’s left to do is send out your invitations and keep your fingers crossed for good weather on the day! Jenny Hart writes on a range of food and health issues on behalf of a family optician directory. Whilst scones and cucumber sandwiches won’t necessarily improve your child’s vision, there’s plenty of time for all that healthy living after the party.